Welcome to Cannon Keepsakes! We have been blessed in so many ways and we want to bless others. Our goal here is to serve you. We want you to be able to wear and share your faith and not be limited because of money. We are called to help each other, serve each other and share with each other. And that is what we are here to do. Although we are not a “nonprofit” organization, we make little to no profit from the sales of our merchandise on this website. We volunteer our time and equipment to make these products. All our products are a “one-off”. This means that when you place an order, we make the product from a blank and ship it out. This greatly increases the cost. We do this out of our home and our funds and space is limited so we can’t afford nor store large quantities of finished products. Our family seems to be continually growing, so this may need to be updated from time to time! Currently there are six kids in our family. Summer is the oldest, then Alyse, Kaylah, Michael, Benjamin and Eliyanah. We (Mike and CJ) were married in 2011. Mike has been walking on this path for over 18 years starting sometime around Spring 2000. CJ started in 2008. The story of how we meet is an interesting one which you can find on our blog page, both Mikes side and CJs side. We have a small home fellowship, 12 stones fellowship, and get together every Shabbat at our house. Each Shabbat we read Torah and have discussions that sometimes last for hours…and of course…we eat! We live in north central Pennsylvania with family near by that shares our beliefs and some family that does not. Like many, we have had our share of struggles, but we continue to be blessed over and over again. Toda Lecha יהוה! All praise and thanks go to Him! When we started Cannon keepsakes a few years ago we started it with a more traditional business mind set. We had ideas that we thought like minded believers would like and appreciate. It would also be a way for us to supplement our income, since neither of us work full time hours. If you have followed us from early on you may have noticed some changes over the years as we slowly shifted our mindset and desire for the keepsakes site. Going from something to add extra income to doing it to strictly serve our mishpacha. As stated before, we are here to serve, and we really enjoy giving things away! Each year for Sukkot we give away about 1000 products and ship them all over the world. Maybe you have seen our “Official Sukkot Tote” or “Sukkot Blessing” mug. Our newest project is our Yesh Tiqvah Project and was established to spread the word that There Is Hope! We have hope in our Messiah. “In His Name the nations will hope” is a clear message in Scripture. Our goal is to share this message with as many people as possible. To do this we are giving away shirts. 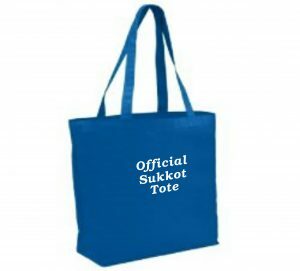 Home of the Official Sukkot Tote.